National Business Book Award winner Chris Turner (centre) at the award ceremony Tuesday in Toronto with co-sponsors Gino Scapillati, BCom ’81, of Bennett Jones and Catherine Roche of BMO Financial Group. Turner won the prize for his book The Patch: The People, Pipelines, and Politics of the Oil Sands. Photo courtesy of Michael Hope. They call it “the Patch,” a plot of land in Northern Alberta home to one of the world’s largest proven reserves of oil. 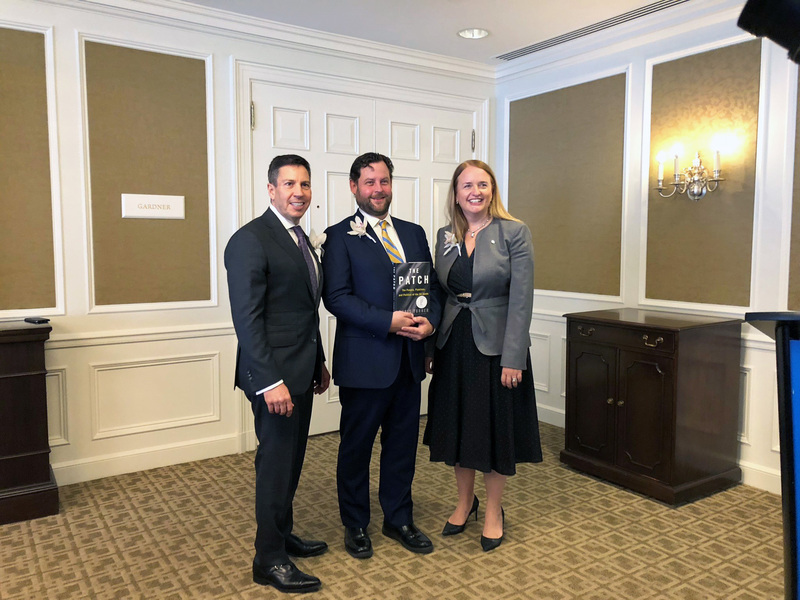 On Tuesday morning in Toronto, bestselling author Chris Turner received the 2018 National Business Book Award (NBBA) for his in-depth and nuanced analysis of the subject in his latest book, The Patch: The People, Pipelines, and Politics of the Oil Sands (Simon & Schuster). With two conflicting world views – one of industrial triumph, the other of environmental concerns in the age of climate change – Turner’s book examines the history, science, and context surrounding the Alberta oil sands and its significance for all Canadians. The 45-year-old author, who lives in Calgary with his wife Ashley Bristowe and their two children, had previously been shortlisted twice for the country’s most prestigious business writing award. Len Waverman, Dean, DeGroote School of Business, served on the jury for this year’s NBBA alongside Deirdre McMurdy, David Denison, Senator Pamela Wallin, and author and publisher Anna Porter. The jury was chaired by Peter Mansbridge, former anchor of CBC’s The National. Mansbridge, who received an honorary degree from McMaster University in 2017, referred to Waverman as an invaluable resource during deliberations. DeGroote and the Toronto Region Board of Trade were supporting partners of the NBBA, while The Globe and Mail and The Walrus were media partners. Joining longtime presenting partner BMO Financial Group was national business law firm Bennett Jones. Gino Scapillati, BCom ’81, is Vice Chair, Strategy and Innovation, at Bennett Jones. He was on hand Tuesday morning to deliver remarks on behalf of the firm. “For more than 30 years, this award has recognized many of the country’s finest business writers,” said Scapillati, who received the 2015 Wayne C. Fox Distinguished Alumni Award from his alma mater. Other McMaster alumni in attendance included David Feather, MBA ’89, President & CEO of Russell Investments; and Andreas Souvaliotis, MBA ’89, Founder and CEO of Carrot Rewards. Souvaliotis is the author of Misfit, a self-published personal business memoir set to be reissued in an updated form by Penguin Random House in 2019. The jury evaluates nominations based on five key criteria: originality, relevance, excellence of writing, thoroughness of research, and depth of analysis. Finalists for the 2018 NBBA also included Looking for Bootstraps: Economic Development in the Maritimes by Donald Savoie (Nimbus Publishing); Stumbling Giants: Transforming Canada’s Banks for the Information Age by Patricia Meredith and James Darroch (Rotman – UTP Publishing); and Creating Great Choices: A Leader’s Guide to Integrative Thinking by Jennifer Riel and Roger Martin (Harvard Business Review Press). One thought on "Praise for the Patch: Chris Turner receives National Business Book Award at DeGroote co-sponsored affair"
Check out the current and previous NBBA award winning titles from McMaster libraries. We’ve got them all!